ICCO & Kerk in Actie provide relief assistance to flood-affected people in India through local ACT Alliance partner CASA. Severe flooding affects the state of Assam (North-East India) and the state of Kerala (South-West India). The floods, said to be the worst in a century, affect over 800.000 people and lead to many Internally Displaced people. The aid consists of food aid, hygiene kits, blankets, clothing, as well as equipment for emergency tents, and support to restore homes. Flood affected populations will be able to meet their basic needs such as Food for at least for 15-20 days. Flood affected populations will be able to meet their most urgent temporary shelter/ NFI needs. Church's Auxiliary for Social Action (CASA) is the social action arm of the 24 Protestant and Orthodox churches in India. CASA is mandated to work for the poor and the marginalized, irrespective of any political, religions and caste consideration. CASA today is operational in 22 states, including five states in North-east India, in approximately 5,000 villages. In addition CASA supports and accompanies around 400 NGOs working on different issues throughout the country. CASA continues to respond to 60-70 small and medium disasters annually and also responds comprehensively to major emergencies with an enhanced perspective in its strategies of integrating a long-term understanding of the causes and consequences. CASA staff from our Assam sectors office and the Zonal Office at Kolkata who have wide experience in responding to emergency situations and the requisite sectoral expertise will be responsible for implementation of the programme. During the night of Sunday the 5 August 2018, the state of Assam in India, witnessed severe rains which have substantially increased the level of water flow in the rivers and the rivers breaking their banks. This has led to flash floods in some districts of Assam and destroyed the normal life of the people. The floods have created widespread damage to houses, fields and livelihoods and affecting thousands of people. These floods are exacerbating the recent floods which affected Golaghat, Lakhimpur, Udalguri, Barpeta, Morigaoan and Hojai, districts in Assam. The floods have affected 6 Revenue Circles, 110 Villages, 6,855 Acres of agricultural land and forests. It has been reported that 81,269 people have been affected. 20,651 people took shelter in 109 relief camps. The loss of human life stands at 46 Number so far since the first wave of floods. The second wave of flood in 2018 has affected 1,05,782 population in 224 villages under 18 revenue circles of eight districts of the State. With three more fresh cases of flood-related deaths from the districts of Dhemaji (Gogamukh revenue circle), Udalguri (Mazbat revenue circle) and Golaghat (Bokakhat revenue circle) the total number of flood-related deaths this year has risen to 38. The current wave of flood has affected the districts of Dhemaji, Lakhimpur, Biswanath, Udalguri, Barpeta, Golaghat, Sivasagar and Charaideo. While in Dhemaji district 20 villages under the revenue circle of Gogamukh have been affected by the floodwaters, in Lakhimpur district 24 villages under the revenue circles of Kadam (2), Narayanpur (2), Bihapuria (7) and Naoboicha (13) have been affected. The Brahmaputra (at Dibrugarh, Tezpur, Guwahati, Goalpara and Dhubri), the Ranganadi (at NT Road Crossing), the Subansiri (at Chauldhowaghat and Badatighat), the Dhansiri (South) at Golaghat and Numaligarh, the Jia Bharali (at NT Road Crossing), the Kopili (at Kampur), the Manas (at NH Road Crossing), the Gaurang (at Kokrajhar), the Barak (at Badarpurghat) and the Kushiyara (at Karimganj) were on the rising trend, while The Brahmaputra at Neamatighat in Jorhat district, the Dikhow at Sivasagar, the Dhansiri (South) at Numaligarh and at Golaghat, the Jia Bharali at North Trunk Road Crossing in Sonitpur district, and the Beki river at Road Bridge in Barpeta district are flowing above danger level. During the evening of 9/08/2018 the state of Kerala witnessed severe flooding in view of the consistent rains which has been there for a couple of days. Vigours southwest monsoon has left a trail of destruction across Kerala, killing at least 87 people so far. This vigorous monsoon eventually has led to the increase in level of water in many dams / reservoirs in Kerala. 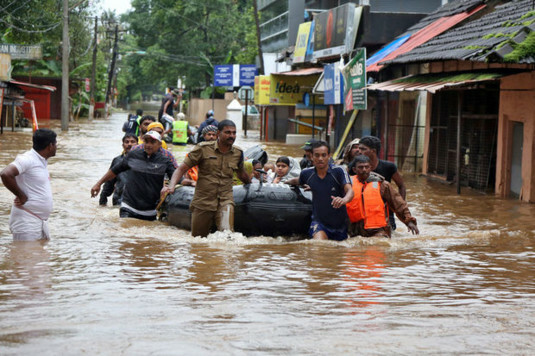 The incessant rains caused havoc flood in many districts in Northern districts of Kerala namely Idukki, Ernakulam, Malapuram, Kozhikode, Palakkad and Wyanad. The flooding apparently had damaged the infrastructure around 10,000 kms of roads and 20000 houses. The release of water has extensively damaged district around Idukki and Ernakulam District. The excessive rains in the other parts have led to severe flooding in Wyanad, Kozhikode, Palakadd and Malapuram Districts. Idukki and Wayand being hilly terrains has witnessed severe landslides also, where reportedly of the 40 human loss from landslides. Many roads in Wyanad and Idukki have been blocked in view of the Landslides. Around 150000 people have shifted to various camps in the state. Army and NDRF has been deployed in all the affected districts. Roads have been cut off and many districts are witnessing power shut down as a precautionary measure. The power shutdown us expected to bring in drinking water crisis. This flood is the second wave of Flood in Kerala in this Monsoon Period. The first wave of Flood affected Wayanad district and the Kuttanad Area of Kerala which is part of Pathanamthitta, Allapuzha and Kottayam. 1,05,782 people affected have been affected so far in the First wave and Second wave of Floods, where 81,269 people of Golaghat have been affected in the Second Wave of Floods during the period 5th to 7th August 2018 of which 20651 people took shelter in 109 relief camps. They are in dire need of relief assistance such as dry food, drinking water, shelter and sanitation materials. The Government is providing food for the people in the Shelter; the flooding is likely to worsen in coming days. Since this being the second wave and the impact are found to have set the people out of normal life and there are still possibilities that if the rains continue the flooding could take place again. Food, temporary shelter, WASH and livelihood restoration measures are very much essential as unmet needs among flood affected households. Since it is a flash flood the impact has been sudden and most of the areas are filled with backater and canals there are issues of water loggin and sanitation. Further in Kerala most of the houses have ariculture / horticulture plantations within thier house premises which has also been damaged. With the severe flooding taking place in many areas, there is a total standstill of normal life where access to livelihood and food is diminised. The government is evcuating 60000 people from low lying area and shifting them Relief Camps and providing shelter and food. 40 rivers in the state is full with water and of the 58 dams 24 dams are full with water. Given this scenario the impacts are felt with women, children and elderly people there is a pressing necessity to provide immediate assistance to minimize loss of life and to ensure that the needs of the most vulnerable are covered. They are in dire need of relief assistance such as basic food, temporary shelter, non food items, hygiene/dignity kit, water storage container, water purifiers, agriculture seeds and allied services and cash transfer to affected households. The proposed relief programme will make special efforts to be inclusive in its approach and give emphasis to the excluded communities. Priority will be given to the most vulnerable sections of the affected people such as the marginalized and excluded communities, minorities, dalits, tribals, widows, physically challenged, transgender, single female-headed families and children. Details of the desegregated population data will be provided in due course. This is short term relief support aimed at life-saving aid. The element of support to restore homes can be seen as contributing to sustainability. Overall: working & supporting a strong local ACT Alliance member CASA strengthens their role and organisation thus contributing to sustainability.